We have been reviewing TB3 external devices for some time now and it is great to be so far away from those 500MB/s and lower portable storage device speeds. TB3 has been a gift to media professionals, to say the least. Up until today, however, there has only been a single device that we have reviewed that has the portability of pocket sized mobile storage, and didn’t need external power of some sort. This was the Tekq Rapide TB3 Portable SSD and, as absolutely sweet as that device is, it just never hit main stream. Still, with such a beautiful cut and performance up to the TB3 ceiling of 2.8GB/s, the Tekq Rapide goes with me everywhere. Can we change that? 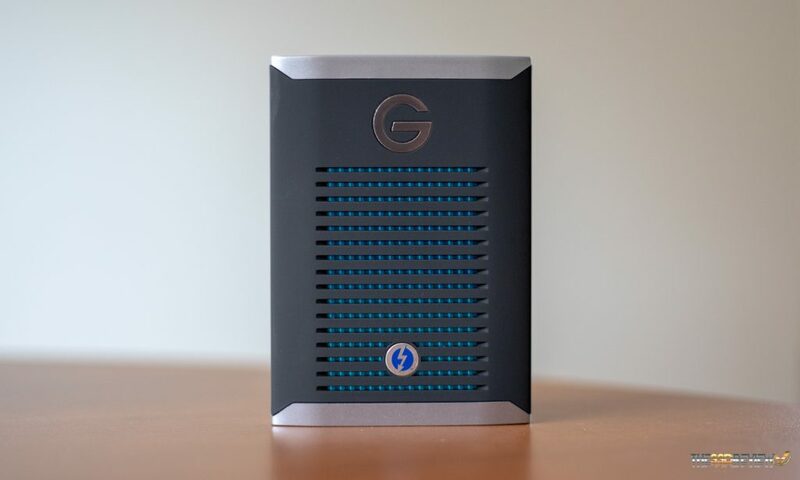 Today, we are reviewing the newest G-Technology 1TB TB3 G Drive and I have to say right off that this is a very attractive mobile storage device. We also have word that it contains the Sandisk Extreme Pro M.2 SSD (SanDisk now being WD who is also the parent company of G-Technology), so we are expecting some really good things from the G Drive. You can check out our review of the SanDisk Extreme Pro M.2 SSD here. 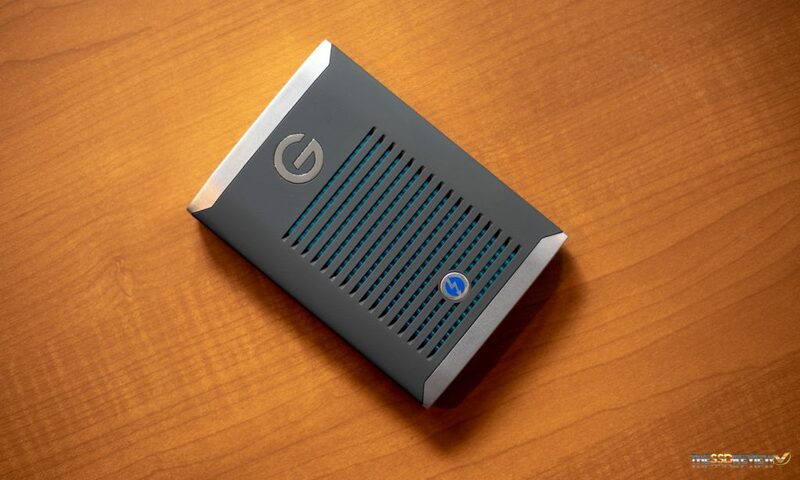 The G-Technology G Drive is a Thunderbolt 3 device capable of 2.8GB/s, but only using the included Type-C to Type-C TB3 cable that comes with the drive. Its shock resistant case can sustain drops of up to 3 metres and has 1000 lb crush proof rating. 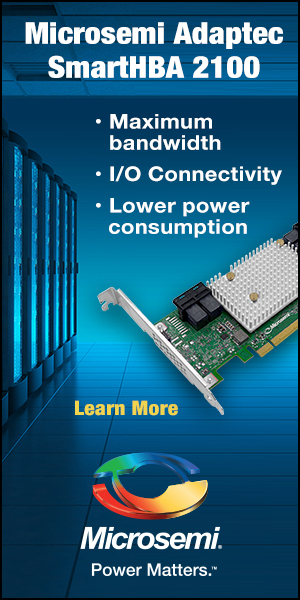 It is bus powered through the single TB3 port and has a five year warranty, which is a really good start. The G Drive is fairly easy to disassemble through removal of 4 Torx security screws, two on each end and then pulling off the end caps. 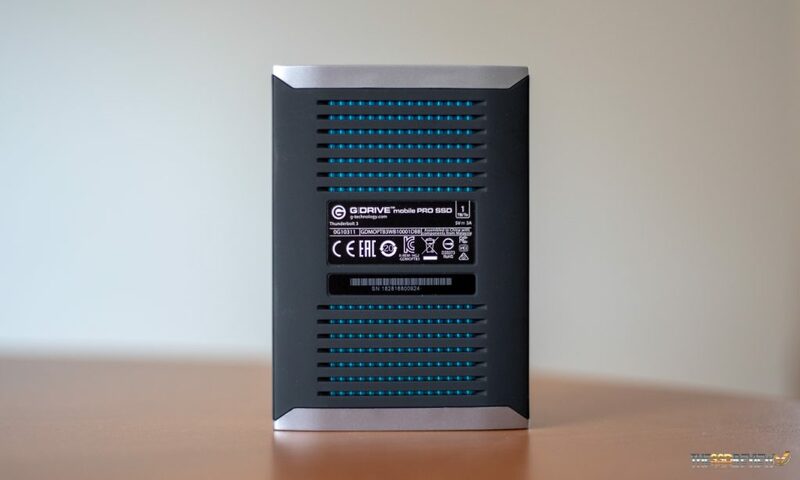 The exterior case appears to be a very soft rubber permanently affixed to an aluminum casing, and just under that, we have a fully removable blue ribbed thick aluminum case which plays the part of heat sink where the PCB and SSD slide very firmly inside that with two thermal pads that make a secure fit. The construction of the G Drive is ideal as heat dissipates adequately and the exterior casing hardly gets warm, unlike the Tekq Rapide that we have on hand. 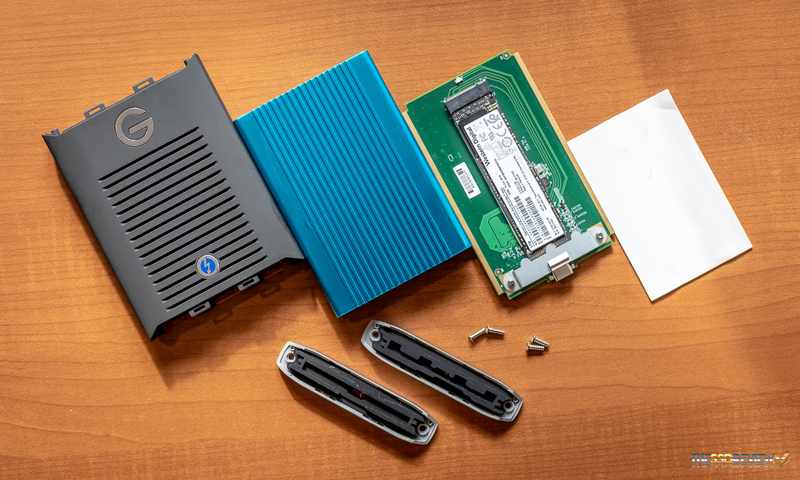 Inside the G Drive is the SanDisk SN720 NVMe M.2 SSD which is the oem version of the latest SanDisk Extreme Pro NVMe M.2 SSD that we have reviewed previously. 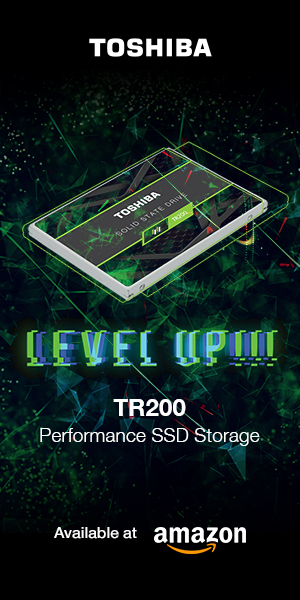 Having this SSD in place is a great start. 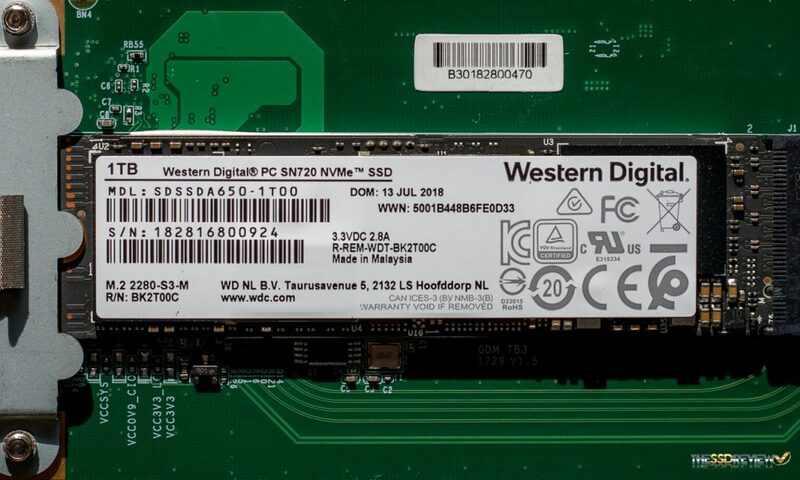 The Extreme Pro M.2 SSD contains a SanDisk 8-channel NVMe SSD controller, two pieces of SanDisk 64-layer 3D TLC memory at 512GB per package, as well as a SKHynix 1GB DRAM cache. 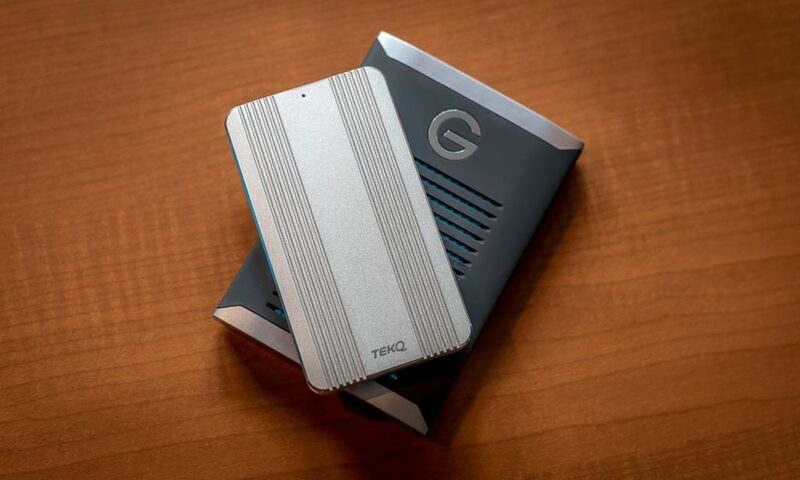 The G-technology G Drive is available right now at Amazon in both the 500GB and 1TB capacity, pricing set at $599 and $999 which just might be a bit steep, but this is a niche device that will have very high demand in the media professional world.